Just two months after launching mobile versions of its flagship database program, FileMaker is rolling out a significant upgrade to the iPhone and iPad versions of FileMaker Go. The 1.1 update to FileMaker Go—which was expected to hit the App Store Wednesday morning—brings greater parity between the mobile and desktop versions of the database application. “We’ve done a pretty good job of letting you take your databases and move them to your iOS device,” Jon Sigler, FileMaker’s vice president of product management told Macworld. The 1.1 versions of FileMaker Go and FileMaker Go for iPad feature a number of improvements, highlighted by the apps’ new send and save options that let users share databases via e-mail and create PDFs. 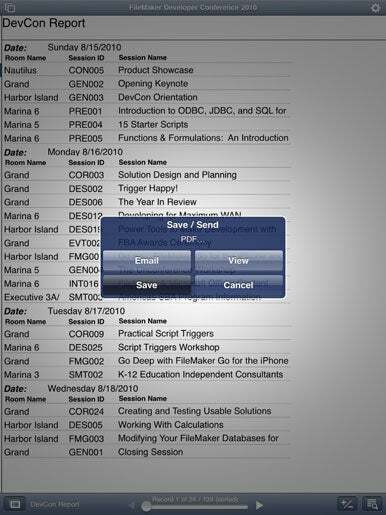 With FileMaker Go 1.1, iPad and iPhone users can create PDFs of their databases and then save them on their mobile devices or share them with others via e-mail. FileMaker Go now lets users make PDFs of their databases. They can then save those files on their iOS devices or e-mail them to others—a feature that FileMaker believes will encourage mobile users to distribute reports and share project information from their iPhones and iPads. The e-mail capabilities in the 1.1 update let users save a copy of a complete database and e-mail it from within FileMaker Go. The feature simplifies data exchange from mobile devices, according to FileMaker. The updated apps also take better advantage of some the built-in features of the iPhone and iPad. “We added the ability to interact with the [iPhone’s] camera and photos directly from within the app,” Sigler said. That means users will be able to take photos with the iPhone’s camera or select photos from the photo library on any iOS device and insert the images into a FileMaker Go database. It’s a simple matter of tapping on a container field in a database and selecting a photo (or taking a new one if you’re using the iPhone version of FileMaker Go). Other features introduced in FileMaker Go 1.1 include enhanced security options that require users to log onto a FileMaker Go database after an iPhone or iPad goes to sleep—ideal for shared iOS devices, FileMaker says. FileMaker Go 1.1 also lets users import records from local or hosted FileMaker databases using script steps. “That’s big for developers and users that need a snapshot of information from other databases,” Sigler said. What’s more, the 1.1 update opens the possibility of improved integration with other iOS apps, thanks to a newly enhanced URL protocol from FileMaker which app makers can use to specify a FileMaker Pro script and script parameters. The feature allows developers to extend FileMaker Go databases, according to FileMaker—say with an app that can capture barcodes and then save that captured data into a FileMaker Go database. The 1.1 update is free to current FileMaker Go users on the iPhone and iPad. The iPhone version of the database app costs $20, while the iPad edition sells for $40.